Flowers that bloom all season are well-suited to gardeners who wish to keep color and interest in their gardens for full seasons. Many perennial and annual flowers are known for short bloom times as limited as a few weeks long. Identifying and choosing long-blooming flowers will broaden your options and allow you to create a garden lively with color all season long. Hybrid tea roses (Rosa x hybrid tea) are perennial flowers that bloom all season long, according to the Clemson University Extension. Hybrid tea roses display large blooms available in all colors of the spectrum (except for blue or black) with sparse green foliage. Rapid growers, hybrid tea roses reach a height of 6 to 8 feet. Thriving in full sun, roses prefer loose, well-drained soil and will bloom all summer. Fringed bleeding heart (Dicentra eximia) is a perennial flower that blooms all season, according to the University of Missouri Extension. Fringed bleeding heart flowers display blooms in dark pink with blue-green foliage, according to the North Carolina (NC) State University Cooperative Extension. Thriving in full to partial shade, fringed bleeding heart flowers prefer moist, well-drained soil and grow to a height of 12 to 18 inches. Fringed bleeding heart flowers begin bloom in early summer. Zinnias (Zinnia angustifolia) are annual flowers that bloom all season, according to the Texas AgriLife Extension. 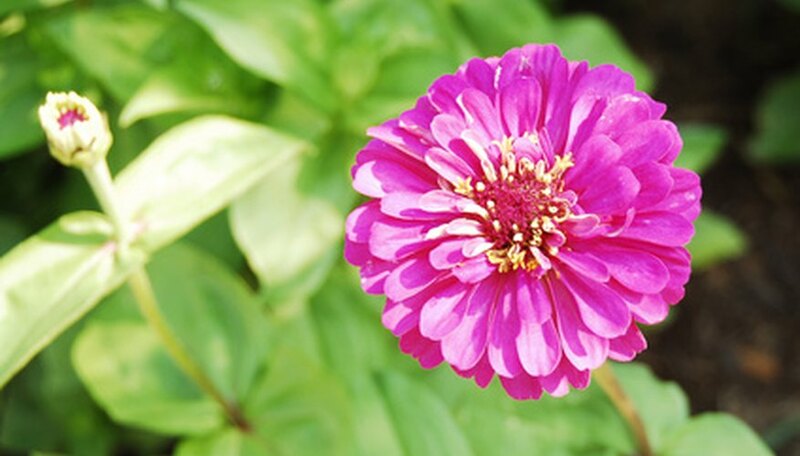 Zinnias display flowers in red, orange, pink, yellow, and white with green foliage. Thriving in full sun and preferring well-drained soil, zinnias grow to a height of 6 to 12 inches. These long-blooming flowers begin bloom in early spring, according to the NC State University Cooperative Extension. Pansies (Viola x wittrockiana) are perennial flowers that bloom all season long, according to the Bexar County Texas Cooperative Extension. Pansies display flowers in blue, purple, yellow, or white hues with either splotched or solid petals with dark green foliage. Thriving in full sun to partial shade, pansies prefer moist, well-drained soil and a mulched bed. Pansies grow to a height of 8 to 12 inches. Pansies will bloom in spring, fall, or winter, according to the NC State University Cooperative Extension.